Cedar Ridge Rhinestone, "My Beautiful Jewel"
A Setter's eyes are one of the jewels of the animal kingdom. I have been breeding, raising and training English Setters for 35 years. Cedar Ridge Setters is known as one of the top English Setters breeders in the USA. We are located in North Central Florida, outside of Gainesville. I breed only field English Setters. Our dogs are FDSB [ Field Dog Stud Book ] registered, which means they are field English Setters, not AKC show English Setters. In short, my English Setters are gun dogs, not show dogs. 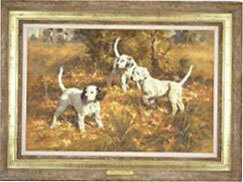 These are hunting English Setters or Field English Setters, as they are called. "All Llewellin Setters are English Setters but all English Setters are not Llewellin Setters". I work closely with English Setter rescue organizations and am always ready to help find an unwanted Setter a good home. Welcome to my web site. I hope you enjoy the English Setter pictures and information. Please feel free to contact me if you have any questions regarding English Setter training, Upland Gun Dog training, English Setter breeding, English Setters at Stud, English Setter puppies or English Setter field dogs. If you are searching for an English Setter, I am one of the best and most conscientious English Setter breeders in the country with over 35 years of experience. English Setters and English Setter puppies are my passion!